What Does Chun-Li Food Taste Like? Sweet and salty mustard chicken stir-fry, apparently. 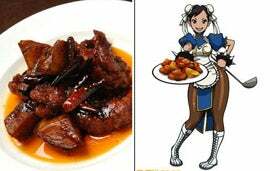 She's just one of the Street Fighter IV-themed Chinese entrees for characters like Sakura, Dhalsim, and Rufus. While the Sakura themed meal is sweet and salty chicken and potatoes, Dhalsim is all about the sweat-inducing spicy noodles. The Rufus meal is made from three types of meat (beef, pork and chicken) in a black sesame sauce. Entrees range from ¥880 to ¥1,380 and are available at these fine eateries from February 12 to February 28: Xin-Li and 10,000 Butaki.